How to build a biblio chair | DIY projects for everyone! 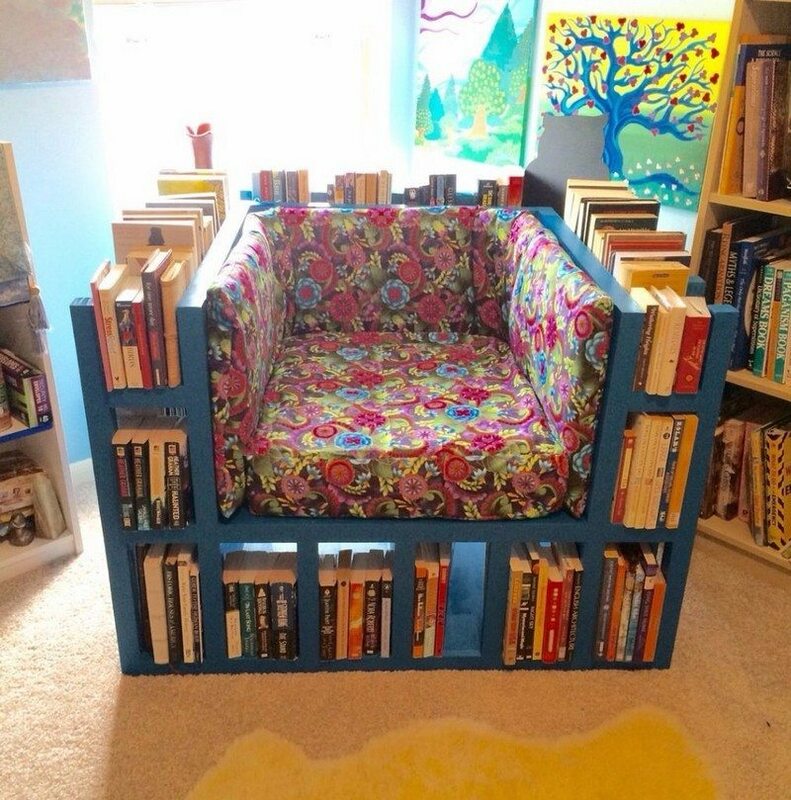 This particular bookshelf chair or biblio-chaise was built by a DIY-er for his wife. We think she’s a happy girl after getting this gift! Though it looks big and wide in the photos, this furniture item actually fits through a standard door opening. In fact, it’s about the same size as a regular single seat sofa. But since this chair is also a bookshelf, it’s got to be a real winner as great space-saving furniture. Perfect for those running out of shelf space! What we love even more about this DIY project is that it’s easy to build. Read more below to see how DIY-er Darko made his bookshelf chair! I started by creating a base that is cut out of 4×8 sheet of plywood and built sides by using 2 x 2-inch pine. Sides are 29″ tall. In between 2 x 2’s I used 2 x 1-inch pieces of pine. To secure 2 x 2 and 2 x 1 pieces to plywood platform, I used Gorilla glue and Kreg pocket screws. Then I used more 2 x 1-inch pine to create support for a first story piece of plywood and secured it with pocket screws and wood glue. Closeups of completed first level sides. I did not take any pictures of adding horizontal seating area piece but it is same size square piece of plywood like the base piece and it was glued down only. Next I started with upper bookshelf slots with 2 x2 in pines. To secure them I used the same method of Kreg pocket screws and wood glue. The seating area is 28.5″ long and 26″ wide. What are the specs on the finished project? It looks like you cut the first piece of plywood in half so it is 4×4. I want to build one for my daughter. Thank you so much for sharing this! Where can I find or purchase a set of plans for this chair? Are there Plans with Dimensions for this project?